A native of Birmingham, John focuses his practice on divorce, family law and probate issues, both in the trial and appellate courts. He is a fellow in both the American Academy of Matrimonial Lawyers (AAML) and the International Academy of Family Lawyers (IAFL- formerly IAML). 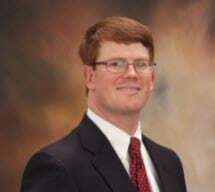 He has served on the boards of non-profits such as the Legal Aid Society of Birmingham and Catholic Family Services. He and his wife Anne, also a lawyer and Birmingham native, enjoy traveling when they get a chance.